Eliud Kipchoge, the reigning Olympic marathon champion says he is ready to lower Dennis Kimetto’s 2:02:57 world record when he lines up at the Berlin Marathon on September 24. The new target comes less than four months after the two-time London Marathon champion took on an ambitious bid to become the first man to ever run a marathon in under two hours. He came close to achieving that feat, running 2:00:25 on the Formula One track in Monza Italy and it is that motivation he hopes to use on his next ambition. “I wanted to show that there is no limit to what a human being can achieve be it in sports or anything else. It is a motivation to me that I ran that time and now, I am looking forward to Berlin. I have trained very well over the past three months and I feel I am ready,” Kipchoge told Sports News Arena. The 33-year old came eight seconds close to breaking the record enroute to last year’s victory at the London Marathon when he ran 2:03:05, setting a new course record. He returns to Berlin, a course he has won once before, in 2015. Kipchoge finished second in the same race in 2013, behind Wilson Kipsang when he set a new record of 2:03:23. The two will meet together one more time in Berlin with Kipsang also eying a shot at the record. Another interesting figure confirmed for the race is multiple track world and Olympic champion Kenenisa Bekele of Ethiopia. Bekele came within six seconds of breaking Kimetto’s record last year at the same course in Berlin, winning the race in 2:03:03, which is ranked as the second fastest marathon ever. With the three, Kipchoge says he anticipates a ‘beautiful’ race. “We are all three top athletes and I respect all of them. But at the end of the day, there will be only one winner. Whoever it will be, the others should come and shake his hand in congratulations. I know I will be among the top three,” Kipchoge said. “It will be a very tough race because both Kipsang and Bekele are very experienced. But for me, I am going there to run my own race. I respect the others but the biggest competition is myself,” a confident Kipchoge further stated. His ambition for a world record will get a favorable venue. The last six World Records over the last 14 years have been broken in the German capital. World Cross Country legend Paul Tergat lowered American Khalid Khannouchi’s record of 2:05:38 to 2:04:55 in 2003. Ethiopian Haille Gabresellasie arrived in the German City four years later, lowering the record further to 2:04:26. The following year, in 2008, Gabresellasie further took the record down, timing 2:03:59. Three Kenyans, Patrick Makau, Wilson Kipsang and Kimetto then went on to be the successors of the record in 2011, 2013 and 2014 respectively. Makau ran 2:03:38 before Kipsang plucked 15 seconds off the record to run in 2:03:23. Kimetto then broke the 2:03 barrier, becoming the first man to run a marathon under two hours three minutes, timing 2:02:57 in 2014. 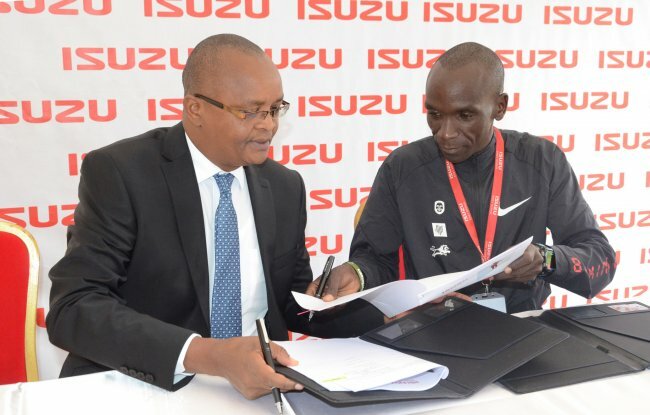 Meanwhile, as Kipchoge prepares for the historic race, he got a shot in the arm with his new sponsors Isuzu East Africa promising him a vehicle worth Sh5.9m if he breaks the record. He was unveiled on Wednesday as the vehicle brand ambassador in a deal worth close to Sh14mn in total. In cash, Kipchoge will receive Sh7m.